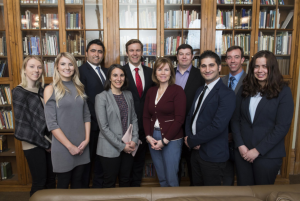 Last week, the New Brunswick Innovation Foundation named the winners of the Breakthru Start-up Competition amid much pomp and anticipation. Over 500 people attended the Breakthru Live Awards Dinner on March 23, 2017, a high-energy event that celebrated the participants and finalists. The talk of the night was what NBIF CEO Calvin Milbury called “the highest quality round of competitors we’ve ever had.” The cross-sectoral group of start-ups is developing products for a variety of industries including personal finance, agriculture technology, video surveillance, waste-to-energy, and more. The top three Provincial victory spots were landed by 3 companies who are prime examples of marrying the old with the new: using modern information technology platforms to innovate in our traditional sectors. Biotechnology and information technology are not separate industries, but rather complimentary tools to develop cross-sectoral solutions. The National Grand Prize was awarded to social app Newpy. Personal finance app Quber took home the CBC Viewer’s Choice Award. New Brunswick has a long history of innovating in our traditional sectors. Historically, we are a land of fishermen, foresters, and farmers, who, to this day, are exporting around the world with value-added products. Companies like McCain Foods, Cooke Aquaculture, and Remsoft are global companies using cutting edge technologies to innovate in our natural resource sectors and create wealth here in New Brunswick. 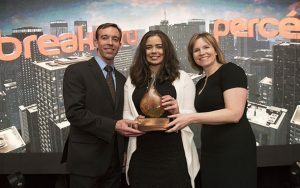 BioNB operates at the centre of the provincial effort to build the bioscience sector in New Brunswick, so you can imagine our delight when Pfera Inc. took the grand prize and WEnTech Solutions and SomaDetect were named runners-up at the Breakthru Awards. The victories represent almost 1$ million in funding across the three New Brunswick companies. These start-ups are led by some of the hardest working people in the province who have the passion and technical expertise to grow companies from the ground up. In all three cases, the founders developed their ideas after working in an industry, identifying a problem, and creating a solution themselves. That is entrepreneurship. So, why them? Why did these 3 companies win? We think it has to do with the revenue-generating projects and pilots that all of them have on the horizon. These companies are using Atlantic Canada as a sandbox to validate and pilot their technologies; a concept that BioNB has been selling to the world for the last 3 years. With one of the strongest start-up ecosystems in the country and a diversity of traditional industries and biomass to work with, we are one of the best playgrounds in which to validate technologies and start companies. Grand prize winner Pfera Inc. is testing their biotech solution for horse breeders in a pilot with PEI farms. Their technology helps horse owners predict precisely when their mares will give birth, saving significant time and money in a small but lucrative industry. Runner-up SomaDetect is on a similar path with their solution for dairy farmers, a detection tool that helps dairy farmers quickly assess the health of their herd and their milk. The region’s dairy industry is certainly intrigued, and SomaDetect CEO Bethany Deshpande is aiming for a five-farm pilot project in 2017. Breakthru’s other runner up, WEnTech Solutions, has built their IT platform W-SAS to help engineers more easily assess the details around waste-to-energy projects. Their resource-saving tool is attracting interest in their industry with paying customers already in the hopper from around the region and across the globe. NBIF said “New Brunswick is the big winner in Breakthru.” We would have to agree! Giving away cash is great, but Breakthru provided a platform for these hard-working entrepreneurs to get visibility regionally and nationally. We can’t wait to see where these companies go next, and we will have our eye on the next bio-innovators for future competitions.